This is a stunning elegant filly with presence, a wonderful temperament, and fabulous movement! We knew early on this one was special. Luciana has an easy going temperament and is well handled. 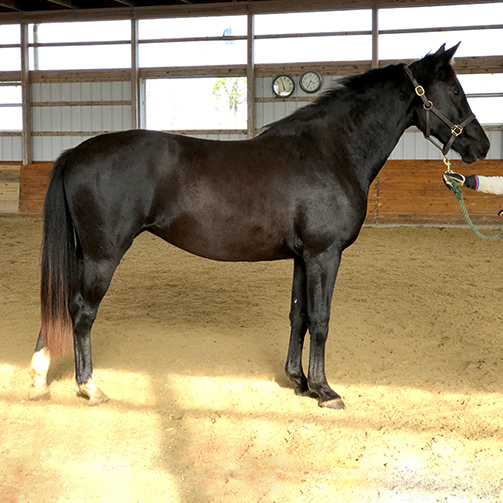 She has impressive gaits that shows us plenty of air time, suppleness, and elasticity. She was very people friendly right from the start and continues to be "in your pocket." She is a leggy filly, modern look with long lines and we would expect Luciana to mature in the 16.3 - 17 hd range. Luciana has impressive performance bloodlines from both Sire and Dam with such greats as Metall, Ferro, Ulft, Amor, Ramiro Z (which we see on both top and bottom) on the sire's side and Sandro Hit, Zeoliet, Contender, Goodtimes on the Dam's side. She would make an outstanding contribution to any breeding program in addition to your next performance horse. Special D is a stallion I've had my eye on for a while as he represents proven combination of Olympic Ferro crossed with G Ramiro Z, which produced his sire Métall. The KWPN describes Special D as follows: "an honest, reliable stallion. He very willing to work with a good attitude. The walk is spacious, rectangular and active, with a good usage of his body. Special D's trot is very tactful and spacious, with super self-carriage, a lot of elevation and a good collection. His canter is extremely spacious and scopey with excellent self-carriage. He is a very talented as a dressage horse and gives his rider a very good feeling." Special D has many approved and licensed sons and offspring competing at the top levels in dressage. He also had one of his offspring competing in the 2016 Olympics for the French team. People love their Special D horses, not only for their talent under saddle but also for their wonderful temperament and trainability.